I am often asked, "Can I bake in my microwave using the Tupperware Heat 'N Serve Containers?" My reply, "of course you can!" If you have not tried microwave baking yet, now is the time! You can whip up some tasty treats in no time at all. Here are a few recipes to try. 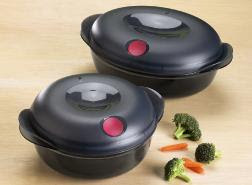 You can find the Tupperware Heat 'N Serve Products by clicking on the link to my Tupperware Store. (Heat 'N Serve Containers are for Microwave Use ONLY). Spray a 6 1/4 cup Heat 'N Serve (tm) container with non-stick cooking spray. Set aside. Mix cake mix, water, and egg. Beat 2 minutes at medium speed. Pour cake mix into Heat 'N Serve (tm) container and microwave on high 12 minutes turning the container 1/4 turn every 2 minutes. Allow cake to cool slightly, then turn it out onto an Impressions (tm) luncheon plate. With a Chef Series (tm) 8 1/4" bread knife, slice the cake in half horizontally and allow to cool completely. When the cake has cooled spread a thick layer of frosting in the middle and lay half the strawberries on top. Place the top layer back on the cake and frost it with the rest of the frosting. Decorate with the remaining strawberries and serve immediately. Optional Toppings: 1/2 cup fresh blueberries & blackberries. In a Mix 'N Store Plus Pitcher combine first 5 ingredients; mix with Saucy Silicone Spatula. Spray 6 1/4 cup Heat 'N Serve Container with cooking spray. Pour batter into prepared container, do not scrape bowl clean and place in microwave. Microwave cake on High for 5-7 minutes rotating container during the baking. Cake should pull away from sides slightly and be slightly sticky on top. Toothpick should test clean when inserted into center of cake. Cool 4-5 minutes and invert onto a serving plate. Garnish cake by topping with apple pie filling. Sprinkle with chopped nuts and a sprinkle of Chef Series Cinnamon Vanilla Spice Blend. In a 6¼ cup Heat ’N Serve™ Container mix together fist 4 ingredients using a Saucy Silicone Spatula. Microwave uncovered on High for 5–6 minutes (rotate every 2 minutes if you don’t have a turntable) until toothpick tests clean. Cool slightly before scooping out of container; serve warm with 2 Tbsp. of caramel sauce (optional) drizzled over each brownie.